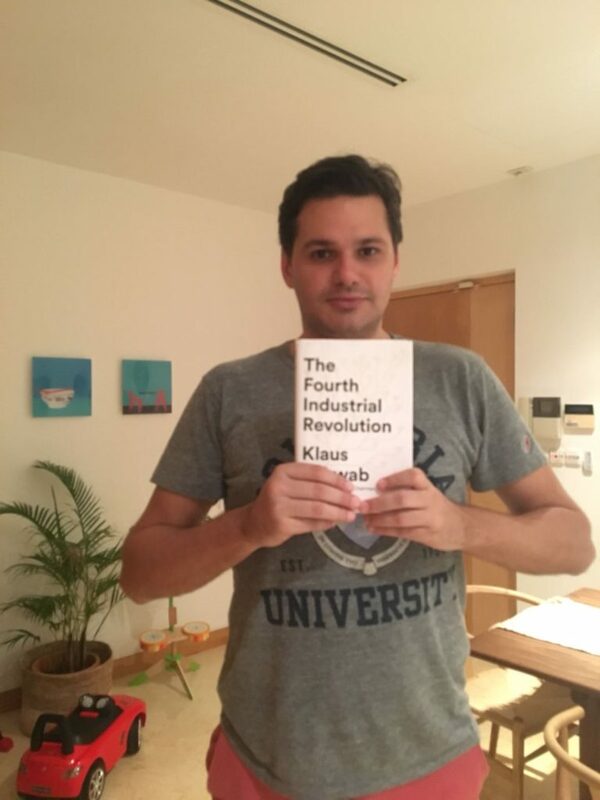 One of the January reading list book, Fourth Industrial Revolution, was recommended by a bright young gentleman, Ogul Havayir. He was so kind to agree to write a book review on this book to share with all the followers. Klaus Schwab starts with a very simple and visionary thesis: human beings are now facing with an unprecedented transformation of their lives from various aspects including work, relations, and institutions. Schwab defines this transformation as a fourth industrial revolution and singles out this industrial revolution from previous ones in terms of its breadth, speed, and scope. Schwab’s intention is to shed light on how this revolution will impact us and how human beings can leverage this revolution for the common good. Most of the arguments advocated by Schwab are supported by the relevant data which cements his views and illustrated through practical examples. In my opinion, Schwab defines a great and condensed framework in outlining the backbone and the potential outcomes of this revolution not only from humankind’s perspective but also governmental, business and global perspectives through accompanying these stakeholders’ relations with very key drivers, ideas, and technologies. What I particularly like about this book is that it enables everyone to be aware of what kind of a transformation that we are currently witnessing and allows us to grasp how we can contribute it and position our lives to fully cope with it. The book prioritizes some new developments and trends as key factors of fourth industrial revolution in 3 main fields such as physical, digital and biological. Schwab gives unique and explanatory examples to underline how deep the impact of megatrends will be. One of the most vivid examples was related to physical technological megatrends. Schwab gives an example of developments of new materials, especially a material called graphene, which is roughly 200 times stronger than steel and a million times thinner than a human hair, and an efficient conductor of heat and electricity. This material is expected to be a superior substitute of steel which numerous economies relied on. Thus, Schwab implies that when graphene becomes price competitive, it will have an enormous impact on steel-based economies such as China, Japan, and the US, and reshuffle the cards in the global economic competitiveness in that field. Several other key trends are discussed with practical examples by Schwab including but not limited to autonomous vehicles, 3D printing, robotics. Schwab also pays heed to how to direct key biological developments toward the best possible outcomes by recapping the importance of the meaning of human, which data and information should be shared with others and what rights and responsibilities we have when it comes to changing the biological genetic code of future generations. Next key topic according to Schwab is that the fourth industrial revolution will have a profound impact on economies, businesses, societies and the individuals. As a techno-optimist, Schwab thinks that humankind has just started to be influenced by the fourth industrial revolution and his thoughts are backed by 3 main sources in which I totally accepted. Firstly, Schwab advocates that this revolution will unearth the latent demand from undeveloped part of the world through making existing products and services available for them. Secondly, the fourth industrial revolution will be facilitating us to deal with negative externalities like carbon emissions and fuel economic growth further. Lastly, businesses, governments, and civil societies will able to grasp the merits of this revolution for the purpose of fully utilizing these merits. In my view, the most important impact of the fourth industrial revolution on the economy will be related to employment. Schwab argues that through the deployment of newly-emerging technologies including AI, robotics and machine learning, various jobs and skills are expected to be automated, indicating a risk associated with the labor substitution. However, his discussion also encapsulates that acceptance and prevalence of these newly-emerging technologies will create new jobs and skills. The counter arguments give rise to the question of which effect will supersede other. Another key impact of the revolution on the economy is the potential deterioration of income inequalities across the world. Schwab argues that whether this revolution will be a winner takes all phenomenon or allow undeveloped parts of the world to catch up developed economies. I was mostly influenced by the impacts of this transformation on the way we work, the way we operate businesses and the way we allocate our resources to create value. Schwab advocates that creation and harnessing of cutting-edge technologies will lower the entry barriers for various industries and will lead to disruption coming from startups and vanishing market shares of well-established large incumbents. These disruptions may result in fundamental changes in the value chains for various industries. According to Schwab, the fourth industrial revolution will have four main effects on business including major shifts in customer expectation, enhancement of products via data utilization and increasing collaboration among companies as well as digitalization of operating models. In my opinion, digitalization of operating models is the most vital effect among all. In order for companies to fully adopt their organizations to fourth industrial revolution, their strategic planning should be able to design the required frameworks and roadmaps to operate companies more agile and faster. Schwab stresses the importance of “platform” strategy and sees it as a disruptive and profitable. Schwab further explains the effects of platforms and underlines how the ownership is redefined with increasing scope and size of platforms. Customers become more willing to pay for services such as access to an online service such as Amazon Kindle or delivery instead of ownership of physical products. Schwab also discussed the impact of fourth industrial revolution on governments and countries, societies and the individuals. Schwab points out that government has a very key role to nurture innovation and incentivize learning and adaptation of any developments that can contribute community. Lastly, potential impacts of this revolution on the individual were discussed by Schwab and concluded that rapid adoption of the technology could weaken basic human capacities such as self-reflection, empathy, and compassion. Thank you again dear Ogul Havayir!